Cosmo Lofts is a 5-story building in Los Angeles, California. Originally built in 1896 as a storage warehouse, the building was converted to live/work lofts in 2004. Originally built in 1896 to house a moving and storage facility. In 2004, the building underwent a renovation by Creative Environments of Hollywood to convert the building to live/work lofts and creative offices. 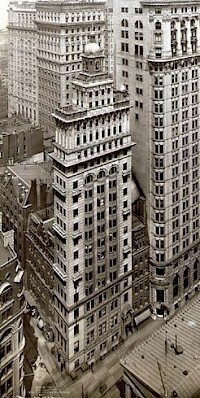 The Gillender Building was an early 20 story skyscraper in the Financial District of New York City. It stood on the northwest corner of Wall Street and Nassau Street, on a narrow strip of land along Nassau Street measuring only 26×73 feet (about 8×22 meters). 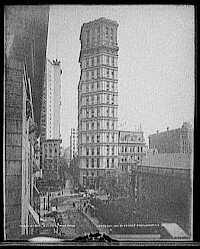 At the time of its completion in 1897 the 273 feet (83 meters) tall Gillender Building was, depending on ranking methods, the fourth or the eighth tallest structure in New York. 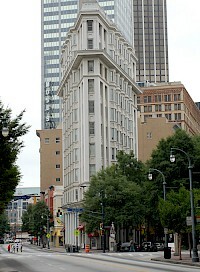 The Flatiron Building in Atlanta, Georgia, officially known as the English-American Building, is a flatiron building completed in 1897. The English-American Building is located at 84 Peachtree Street in downtown Atlanta, on the wedge-shaped block between Peachtree Street NE, Poplar Street NW, and Broad Street NW, also creating a one-block break in Williams Street. 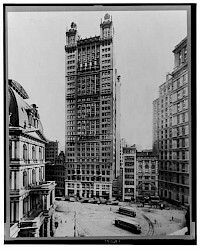 It was completed five years before New York's Flatiron Building, and shares a similar prominent flatiron shape as its counterpart. 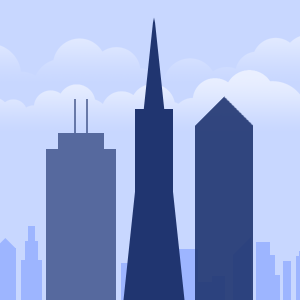 Central Tower is a 91 m (299 ft) 21 floor of office building at Market- and Third-Streets in San Francisco, California. The building has undergone numerous renovations since its completion in 1898 as the Call Building and later, the Spreckels Building. 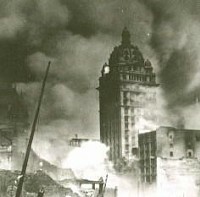 The building first housed the San Francisco Call and was named accordingly until the newspaper's merger in 1913. 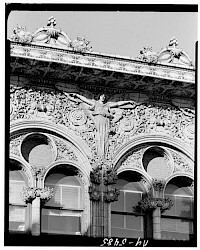 It was then called the Spreckles Building after the newspaper's owner John D. Spreckels, and his father Claus Spreckels. The North American Building is a historic high-rise building at 121 South Broad Street in Philadelphia, Pennsylvania. Designed by Philadelphia architect James H. Windrim (1840–1919), it was built in 1900 as the headquarters of the Philadelphia newspaper The North American (founded 1839). The building was commissioned by Thomas B. Wanamaker, the newspaper's publisher and son of John Wanamaker, the department store founder. 29 South LaSalle is a proposed 51 story skyscraper in Chicago, Illinois designed by Lucien Lagrange Architects. It would stand at 870 feet (265 m). 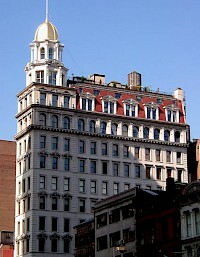 This project would include a "renovation", and facdectomy of the adjacent New York Life Insurance Building. 29 S. LaSalle was at one time the site of the Equitable building, formerly known as the National Life building, built in 1902. It was 12 stories and one basement high, on spread foundations. Jennie and Mundie were the architects.